events like the Bacardi Festival, the Australian Salsa Championship Finals the Sydney Latin Fiesta and recently the first Sydney Bachata festival. Dj Damian will open the night with his best collection of Salsa Sensual and Bachata tunes. 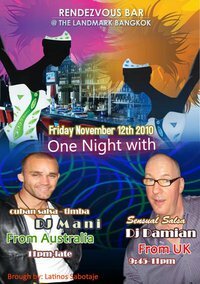 Dj Damian has been around in the Bangkok salsa scene for many years and he is back for one night only. NOTE: Every week we select 10 lucky people to be placed on the guest list. Simply send us an email with your full name and phone number to: latinos_sabotaje@yahoo.com (if your name is selected, you will be notified by sms on your mobile phone.